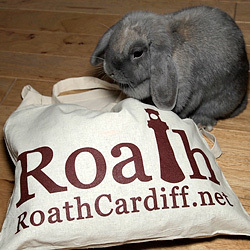 Some of Roath Park’s earliest features are now long gone and largely forgotten. They include the bandstand and concert pavilion (described in a previous article), the aquarium and fish hatchery, the refreshment house, and several rustic shelters and rustic bridges. Fortunately these have been preserved via contemporary postcards. Pictured left in a postcard dated 1907, the aquarium was a small brick building with a thatched roof. It was built in 1899, roughly in the centre of the Botanic Garden. One section was equipped as a fish hatchery, the purpose of which was to keep the lake well stocked with trout to support fishing. In the other part of the building was the aquarium, which the Parks Committee hoped would provide an educational experience for visitors to the park. The hatchery was operational from 1900, but the aquarium did not open to the public until June 1903. Owing to an apparent lack of interest from visitors, the following year a notice was placed on the building explaining its function, but it seems that the aquarium never fulfilled the hopes of the Parks Committee. In contrast the hatchery flourished after some early difficulties had been overcome. It produced plentiful young fish, which were reared in ponds in the Wild Gardens before being placed in the lake. There was also a regular surplus which could be sold to provide income. For example in the financial year ending March 1909, fish to the value of £70 were sold, while in April 1909 more than 25,000 young fish were placed in the shallow parts of the lake. The success of the hatchery was short-lived. From the 1911 season fishing became less popular owing to the declining stock of fish in the lake. Writing in 1922 the Chief Parks Officer A.A. Pettigrew attributed this decline to the increasing popularity of boating and the possible contamination of the lake by surface drainage from tar-sprayed roads. The effect was that the supply of ova from fish in the lake was also reduced, and the hatchery was no longer able to produce a satisfactory supply of young fish. In the early 1920s steps were taken to revive fishing and restore the hatchery, but anglers were not tempted back, and there were no further attempts to keep the lake stocked with trout, nor to rear fish in the hatchery. An inventory of parks buildings and equipment in 1938 recorded no equipment in the aquarium and hatchery, confirming that both had fallen into disuse. In November 1944 the Parks Director reported on the dilapidated condition of the thatched roof of the building. The estimate for repairs was £200 and it decided to defer the work. The building was evidently demolished not long after: it was not shown on the 1954 Ordnance Survey map. 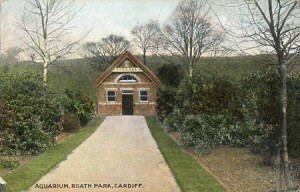 Its position is now occupied by a small rectangular lawn with seats arranged around three sides and backing onto the stream..
Roath Park’s refreshment house was built between 1899 and March 1901. 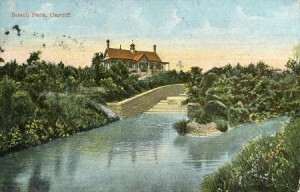 It stood at the western end of the Promenade, beside the Weir, as shown in the postcard on the right, dated 1904. Aerial photographs and Ordnance Survey maps show its continued presence in this location until the late 1960s. In its early days the refreshment house was not allowed to open on Sundays, despite Sunday being one of the busiest days for visitors to the park. This became a controversial issue, with several proposals being put to the Council to allow Sunday opening. In April 1903, for example, 645 ratepayers signed a petition in favour of the idea, but it was opposed by the Churches and defeated in a Council vote in July. Sunday opening was finally approved by the Council in 1913. Although there was again opposition on religious grounds, the view prevailed that it was not unreasonable “to make provision by which the worn and the weary could have a cup of tea at the park on Sundays” [from the Western Mail, 15th April 1913, quoted by A.A. Pettigrew]. Visitors to the park could also take advantage of picnic tables on the west bank of the lake, roughly opposite the present day Highfield Road. Close by was a shelter, to which a gas supply was installed in the summer of 1908, with a penny-in-the-slot gas stove for picnic parties to obtain hot water. 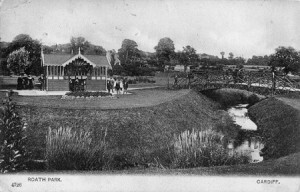 The image below showing a rustic bridge and shelter in the Pleasure Garden is from a postcard postmarked 1904, though the photograph was probably taken by Francis Frith in 1896. There were several bridges of this design in the park – four in the Pleasure Garden and two in the Wild Gardens – as well as a number of similar shelters in Roath Park and other Cardiff parks. 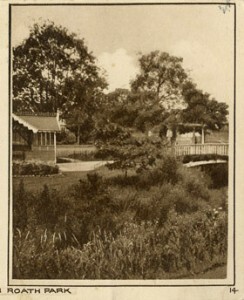 The image below right is from a postcard dated 1943 and shows the rustic bridge to have been replaced by a new structure, possibly the one still in existence. At that time the rustic shelter was still present. The brook is thought to have been straightened in the early 1960s: the Ordnance Survey map dated 1965 shows the brook taking a more direct course through the Pleasure Garden, with a single bridge beside the bowling green. By the 1970s the Ordnance Survey maps indicate that the rustic shelters had been removed both from the Pleasure Garden and from elsewhere in Roath Park. In addition to the evidence in old postcards, Roath Park’s lost features are documented in an unpublished history in six volumes by A.A. Pettigrew: The Public Parks and Recreation Grounds of Cardiff, available at the Cardiff Central Library Local Studies Department. Read more on Anne’s blog and follow her on twitter here. I loved reading about the past features of the park and its uses. Thanks!